Edit: This giveaway is over. Last month, I finished reading the recently published book authored by my online friend and fellow blogger, Carolyn Thomas. 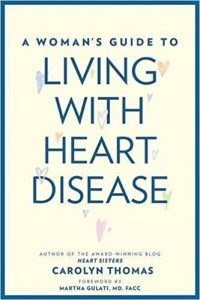 The book’s title is, A Woman’s Guide to Living with Heart Disease, John Hopkins University Press (2017), first edition, Baltimore, MD. 168 pages. Women’s health. Click on image to buy on Amazon. Why would I want to review a book about heart disease? For starters, February is Heart Health Month, so there couldn’t be a better time. But the main reason I want to share about this book with you, my dear readers, is because this is an important book about an important topic that might impact YOU or someone you care about – cancer or no cancer. The American Heart Association recently put out a statement reminding us that cardiovascular disease is the leading cause of mortality in women, not breast cancer. In addition, the negative impact of some chemotherapy and radiation regimens commonly used to treat breast cancer on heart health has been proven to potentially increase risk for cardiac problems in some cancer patients, sometimes years after treatment ends. You might be thinking, I’ve had breast cancer, for crying out loud. Surely I’ve reached my disease quota. Now you’re telling me I need to worry about heart disease too? Maybe so. This is just reality. Of course, this does not mean women should not follow a recommended chemotherapy or radiation regimen, nor does it mean you (or I) should go crazy worrying about a possible increased risk for heart disease. It does mean patients and doctors alike, must be aware of this increased potential risk. Another reason I wanted to review this book is because I’ve been a fan of Carolyn’s blog, Heart Sisters, for years. Her blog focuses on heart disease, however, the topics she writes about often relate to the breast cancer experience as well. Disease overlap, I guess you’d call it. So, let me tell you about this book and why it’s a must read. A Woman’s Guide to Living with Heart Disease is a wonderful blend of accurate, valuable information about heart disease in women. The book is also part memoir with Thomas candidly weaving in aspects of her personal experience, including being misdiagnosed, as well as experiences of other women. Why a book specific to women and heart disease? Heart disease is different in women. Women experience different symptoms. More importantly, too many women do not seek out treatment and often when they do, they are misdiagnosed. Thomas is on a mission to educate women about all things heart health related. 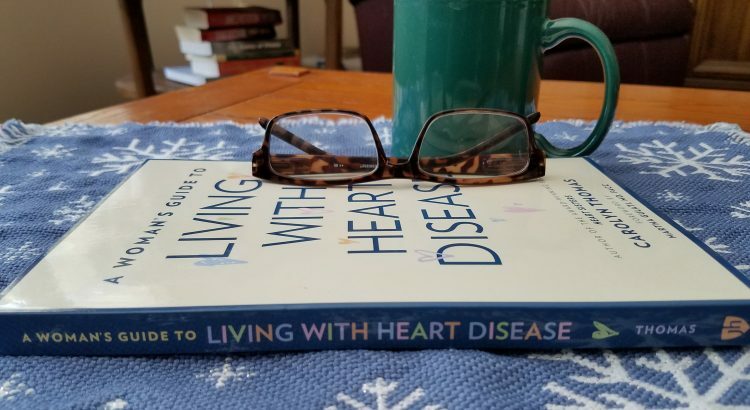 A Woman’s Guide to Living with Heart Disease is an important, much-needed book that sheds light on a host of topics directly impacting women’s heart health. Obviously, this is a serious book about a serious topic, but if you’ve ever visited Heart Sisters, like me, you already know that Thomas writes with a compassionate, engaging tone filled with sharp wit, loads of humor and a healthy dose of cynicism thrown in as well. Now, I’ll share a few of my favorite parts. I moved far, far away to a different country. I couldn’t speak the language, I didn’t know the culture, and I had no map to find my way back home. I found that nothing around me felt familiar or normal anymore. I was in a profound state of denial and shock. I was afraid of every odd twinge my body experienced. I also felt deeply ashamed, and shocked, because I just could not seem to pull myself together. I love the section in chapter six called, “But You Don’t Look Sick,” and I’m pretty sure you will too. …the words (but you don’t look sick) can somehow diminish and invalidate reality, implying that she can’t possibly be as ill as she claims, given how good she looks at first glance. It’s the curse of all who live with an invisible illness diagnosis – and a cruel irony at that, given that a curse is the last thing that sick people need on top of everything else. Thomas also addresses overused war terminology as well as society’s seemingly relentless emphasis on the need for brave positivity. Yours truly is quoted about this on page 107! I can, with enough practice and determination, learn to adjust, to cope, to manage, to function, to put one foot in front of the other in order to adapt to this new normal of living with ongoing cardiac issues every day, but please don’t insult me by implying that my diagnosis was somehow a lovely gift-wrapped present that I must have needed in order to bring meaning into an otherwise meaningless existence. 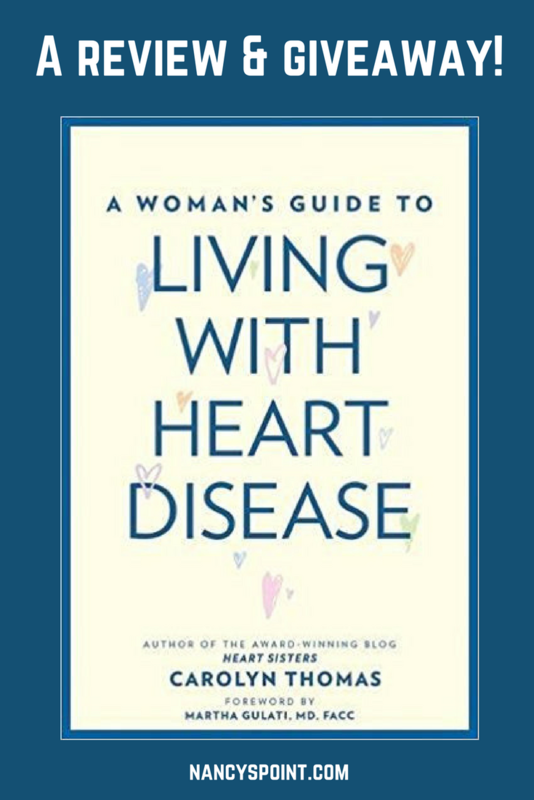 A Woman’s Guide to Living with Heart Disease offers practical, doable tips on how to find your patient voice, how to handle fatigue, how to ask for (and accept) help and more. In addition, there are suggestions for doctors, nurses and other hospital staff members on how to treat patients. The included checklist on exam room etiquette is priceless. Courtesy and good manners in medicine should not be too much to expect. Remember when you were just a person and not a patient? Hmm, not sure I do. I’ll close by saying, A Woman’s Guide to Living with Heart Disease is a book EVERY woman needs to read. February is Heart Health Month, so this is the perfect time to get your copy. Because what could be more important than learning how to take better care of your heart health? If you’d like a chance to win a FREE copy of A Woman’s Guide to Living with Heart Disease, leave a comment below by 5 pm CT on February 20th telling me you’d like to be entered, and you’re in! Good luck! This giveaway is open to US readers only. The winner will be announced on this post. WINNER! Congrats to Honey Bee! She’s the lucky winner! Thank you to all who participated. Do you know the symptoms of a heart attack in women? If applicable, was increased risk of cardio issues discussed with you prior to cancer treatment? About the author: Carolyn Thomas, a journalist and public relations specialist, is a graduate of Mayo Clinic’s WomenHeart Science and Leadership Symposium for Women with Heart Disease. She is the creator of the blog Heart Sisters. Get more articles from Nancy’s Point in your inbox once a week. Click Here. I would like to be entered into the drawing for the book. Thank you for all you do to inform and empower us breast cancer survivors. Deana, You’re welcome. I try to do what I can. You’re entered! As a paramedic I feel fairly confident in knowing about heart disease; however, as a paramedic I know that women are frequently mis-diagnosed and I know that my risk for heart disease increased with the chemo, radiation and the current AI Rx. Please enter me in the drawing because I believe that information is empowering. Rita, Interesting that you also mention women being frequently misdiagnosed when it comes to heart disease. You’re right, of course. Information is empowering. Or can be anyway. You’re entered. Thank you for participating and thank you for the important work you do. I would like to be entered in the giveaway for the drawing about the book for heart disease. Thank you. Eleanor. You’re in. And you’re welcome. Thanks so much for such a lovely and generous review of my book! I’ve learned over the years that becoming a patient means we share a lot in common with others who are feeling shocked, fearful and overwhelmed at becoming a patient too – no matter what the diagnosis. I suspect that’s why you’re not the only woman diagnosed with breast cancer who reads my blog! And almost every day we see emerging research on yet another risk factor that’s linked to significantly increased chances of subsequent heart disease (e.g. pregnancy complications, depression, early menopause, diabetes, arthritis, lupus, and of course, breast cancer). I’ve been writing about these links since I wrote a post back in 2009 called “Breast Cancer Survivors At Increased Risk for Developing Heart Disease”. You have no idea how thrilled I am to read in your book review that Chapter 7 was your “very favorite” chapter (did you know that the anonymous cardiologist who had to review the entire manuscript draft before we could proceed to publishing it told me that Chapter 7 was “irrelevant to heart patients” and should be deleted?) As you can tell, however, I managed to convince my publishers that Chapter 7 was indeed relevant to patients. I really appreciate such a positive review, Nancy – it means a lot to me. Carolyn, You’re very welcome. I’m glad you like it. I looked forward to reading your book and writing a review ever since I heard about it. It’s such an important read for all women. You are saving lives. One heart at a time. Thank you for sharing your experience, knowledge about heart disease and writing skills with the world. One more thing – chapter 7 is my favorite and not just because that’s the one I’m quoted in either! 🙂 It is very relevant; I’m very glad you fought to keep it in. Well done. All of it. It’s wonderful to see you spreading the word about this book and about Carolyn’s must-read blog as well, Nancy. Ironically, bc (before cancer, of course) I was far more concerned about cardiac health than cancer. Having been through treatment I’m even more acutely aware of the risks of heart disease in women. In fact, older breast cancer survivors are more likely to die of heart disease than cancer. That’s pretty sobering. Carolyn consistently provides useful information, pithy insights and helpful strategies. Her blog is truly empowering as well as solidly informative. Your giveaway is a wonderful way to observe American Heart Month, Nancy. I’d love to win the book of course, but I think all of us who’ve read this blog today are winners already! Julia, If you’ve read my memoir (and I think you have), you might remember what sent me to the ER was chest pain. There is some heart disease in my family, so that’s where my mind went first. I am aware of possible elevated risk of heart issues post cancer treatment too, and it’s one reason I wanted to review this book. It’s so important for the bc community to be aware, not paranoid, just aware. Of course, I totally agree with you about Carolyn’s blog. It’s terrific. Thank you for your kind words and thank you for participating in my giveaway drawing. I’d like to be entered. I have been a heart disease woman for 13 years. 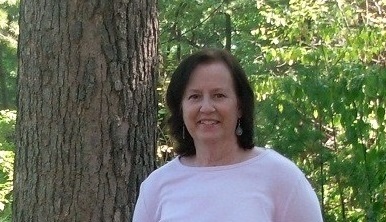 I am 55, and have had two open-heart surgeries. With the last surgery, I also had a heart attack. Lori, You’re entered. Good luck. I am very interested in reading this book! I suspect that my heart health has been compromised as a result of chemo, breath holding (left sided) chest wall radiation, and now taking an aromatase inhibitor. Hypothyroidism was added to the mix during this past year (yay!). There is also a history of heart disease in my family (my mother and both maternal grandparents). And so while I do my best to live a healthy lifestyle, the possibility of heart issues looms in the back (sometimes front!) of my mind. Scary! Cathy, I am sorry your heart health has been compromised. I understand that looming feeling you mentioned. We do the best we can, day by day. Thank you for sharing. You’re entered. Mary, Oh my gosh, how scary. And sad. I am very sorry about your mother’s death. And then you had a heart attack two hours later! And yes, those two gifts you received, ugh. Maybe the epiphany is that there is no epiphany. I like that. Sorry about the US restriction. Mailing cost gets outlandish. Thank you for sharing anyway. Appreciate it. I would like to learn more and sign up for a chance at getting a free copy of your heart book. I love your quote about being in a foriegn country and not knowing the language. This is exactly how I am feeling while figuring out my way through this breast cancer diagnosis. I could really use a tour guide to help me navigate through this trip or at least a map and dictionary. It’s easy to get overwhelmed when researching about my health journey. I have some major concerns about my heart health in addition to my breast cancer. This sounds like something that would be super helpful. Thanks! Cassy, You’re entered! And I am sorry to hear about your major heart health concerns. Please enter me in the drawing for a copy of Carol’s important book. This lifesaving information should be in the hands of every woman, every cardiologist, every emergency room and every EMT. My sister-in-law was told she was having a panic attack, and died in the ambulance of a heart attack. Pat, I agree about the importance of this book. I am so sorry to hear about what happened with your sister-in-law. That is very sad. My condolences. Thank you for sharing that and thank you for entering my giveaway. Thank you for raising this. Some of the comments were especially on point for me. Throughout both cancer and treatment, I looked the picture of health, actually better than before because of the “Look Good, Feel Better” program. My “illness” was invisible so others expected much more than I could, or can, deliver. I was misdiagnosed with lymphoedema months before they discovered it was Congestive Heart Failure the year following chemo treatments and radiation. I am now living with CHF (on five medications for it). Please take symptoms of shortness of breath and swollen legs, feet, and ankles very seriously. A good cardiologist can literally save your life. Now I can monitor myself because I know what to look for. And I get the least thing checked out. Better safe than sorry. Thank you, Nancy. This is so important. Honey Bee, Looks can be so deceiving, can’t they? I am sorry to hear that you are dealing with CHF issues. Thank goodness you eventually received an accurate diagnosis though. Better safe than sorry, you are so right about that. Thank you for commenting and participating. You’re entered. (And you’re welcome. It is very important indeed). This sounds like a great book! I, too, am a fan of Carolyn’s blog. I do think our society is much less aware about heart disease in women. I think that paradigm is changing, although ever so slowly. Doctors and patients need to know the symptoms of heart attacks in men AND women.